These little gems are show-chromed with a special color disc which shows through the holes. With a special all-weather adhesive disc on the back, they pop right into front or rear calipers. They´re also the perfect highlight on your dipstick cover, some custom gas cap covers, or anywhere else. Precio original:24.78€ Precio Oferta:12.00€ IVA y portes incluidos. Cuando haga mal tiempo podrás disfrutar plenamente de este accesorio. Mantendrá el aire frío y la lluvia alejada de tí. Se monta fácilmente en cuestión de minutos. Precio original:86.72€ Precio Oferta:45€ IVA y portes incluidos. Precio original:63.50€ Precio Oferta:35€ IVA y portes incluidos. A great looking way to hide the unsightly axle & axle adjuster section of the Softail swingarm. Two versions offered. Lighted version contains super-bright red L.E.D.´s housed in a smoke lens capsule that fit into a recessed pocket on the trailing edge of the cover. These single circuit L.E.D.´s can be wired as auxiliary running lights or turn signals, or brake lights. Precio original:111.50€ Precio Oferta:40€ IVA y portes incluidos. Transform your stock cast aluminum or wrinkle black finish to glistening chrome. Precio original:98.93€ Precio Oferta:36.00€ IVA y portes incluidos. This is one of our most popular Softail accessories. This high quality die-cast cover features a ball-milled detail & a lush chrome finish. The frame covers install in minutes & will vividly enhance the appearance of your Softail all without having to remove the existing foot-peg mounts. Add a set of Küryakyn swing arm covers for the ultimate look. It is important to remember that the reason we offer so many versions of Boomerangs is not due to differences in the frame itself, but due to components bolted to the frame that affect installation of our covers. Exhaust support brackets will directly affect which covers to order. Please read the applications & notes carefully before ordering. Boomerang frame covers are not compatible with H-D passenger footboards. Precio original:142.11€ Precio Oferta:63.00€ IVA y portes incluidos. Este cromado para el bastidor incorpora una linea de LED´s situada en la parte trasera que puede ser conenctada para funcionar como luces de posición o luces de freno. Valido para:Todas las HD 86-99 Softail (excepto 00-07 Deuce; 07 FLSTF, 06-07 FXST, FXSTB, FXSTS). Precio original:175.50€ Precio Oferta:95.00€ IVA y portes incluidos. Aggressively styled, these axle caps let everyone know who´s the boss. By themselves or coupled with other accessories from the Stiletto line, these axle caps are killer! Three styles are offered to fit Late Model H-D. All Stiletto Axle Caps are sold in pairs. Precio original:116.60€ Precio Oferta:45€ IVA y portes incluidos. Precio original:116.60€ Precio Oferta:45.00€ IVA y portes incluidos. Precio original:20.60€ Precio Oferta:12€ IVA y portes incluidos. Precio original:156.00€ Precio Oferta:60€ IVA y portes incluidos. Precio original:145.00€ Precio Oferta:55.00€ IVA y portes incluidos. Valido para: Harley Davidson 99-01 Road Kings y 00-01 Dressers. Precio original:100.00€ Precio Oferta:40€ IVA y portes incluidos. Valido para: Todos los modelos Sportster de Harley Davidson desde el año 91 al 03. Precio original:73.50€ Precio Oferta:32.00€ IVA y portes incluidos. Valido para:Harley Davidson Softail desde el año 00 al 06 FXSTD. Precio original:142.11€ Precio Oferta:67.00€ IVA y portes incluidos. Finish off that rear brake with our pure custom looking Rear Caliper Cover. You won´t believe the difference! Precio original:36.80€ Precio Oferta:18.00€ IVA y portes incluidos. Precio original:74.00€ Precio Oferta:35.00€ IVA y portes incluidos. Kuryakyn Chrome Upper Swingarm Covers smooth the transition from tubing to casting on your 86-99 Softail. Installed in less than an hour, these covers really clean up your swingarm. Precio original:68.00€ Precio Oferta:30€ IVA y portes incluidos. No stamped, thin metal here. Our die-cast chrome cover really looks like it belongs on your motor. After all, the rest of the motor is cast, so a stamped cover just can´t look this good with it. Hold our cover in your hand, along with the tin one, and man, will you see and feel the difference. Valido para: Harley Davidson 92-99 Softail y 92-98 Dyna. Precio original:60.00€ Precio Oferta:25.00€ IVA y portes incluidos. Here´s a quick and easy way to conceal the frame´s top tubes on 00-later Softails. Our creamy smooth chrome covers tuck in behind the fender struts and slip up under the fuel tank. - - Note: As a general rule, FXST models come from the factory with seats that fasten to the rear fender only. Custom seats may not fasten the same way as the O.E. seat. To ensure you select the correct frame covers, take a moment to confirm how the seat is mounted before ordering. Valido para: Todos los modelos de Harley Davidson Softail 00-07 (excluyendo 00-07 Deuce, 06-07 FXST, FXSTB, FXSTS) equipadas con asiento que se SOLO se sujete al guardabarros trasero. Precio original:99.50€ Precio Oferta:40€ IVA y portes incluidos. These fender tips add a nostalgic touch to any bike in seconds! Models are available to fit most OEM H-D fenders. Simple installation requires no drilling and can be done without any tools. A great way to cover dinged fender tips. Precio original: 43.00€ Precio Oferta: 18.00€ IVA y portes incluidos. With so many riders now using Side Mount License Plates or Bullet Style Rear Turn Signal Brackets, Kuryakyn have come up with an appealing way to cover the exposed holes left in the fender after the stock license plate bracket is removed. Cover installs in minutes and completely covers the "footprint" left by the stock mount. This listing is for the Tribal Style version of the cover. Fits all Harley Davidson models with standard 3-bolt fender mounted license plate brackets. Will also cover the 4th hole found on some Dyna and Sportster models. Made of chrome over ABS. Each side is 100m long and cover is 85mm high. Precio original:30.00€ Precio Oferta:13.00€ IVA y portes incluidos. Precio original:28.50€ Precio Oferta:13.00€ IVA y portes incluidos. Esta mezcla atemporal de arte de alta tecnología y su estilo gótico, hace que los Gladiator sean el toque final perfecto para tu cuadriga. Precio original:98.90€ Precio Oferta:40.00€ IVA y portes incluidos. Con estos cromados para el eje delantero le haras saber a todo el mundo quien es el jefe. Por si mismos o junto con otros accesorios de la linea Stiletto, ¡convierten tu rueda en una autentica killer! Precio original:84.25€ Precio Oferta:50.00€ IVA y portes incluidos. Precio original:46.00€ Precio Oferta:25.00€ IVA y portes incluidos. Se puede montar en: Modelos Evo Big Twin del 79-en adelante con guardabarros trasero estilo Bobber. Precio original:48.10€ Precio Oferta:20€ IVA y portes incluidos. Precio original:27.48€ Precio Oferta:13.00€ IVA y portes incluidos. These premium quality accessories quickly & easily allow you to remove the heel shift lever on Dressers, Road Kings, or any FLST Model. Unique design keeps the shift shaft in perfect alignment to avoid premature shaft wear, a problem common to similar products. The Delrin lining eliminates rattles & keeps your bike shifting as smoothly as ever. Precio original:46.33€ Precio Oferta:20.00€ IVA y portes incluidos. Add a classy touch to your engine. Held in position with set screws, ensuring rattle- free performance. Precio original:50.00€ Precio Oferta:25.00€ IVA y portes incluidos. 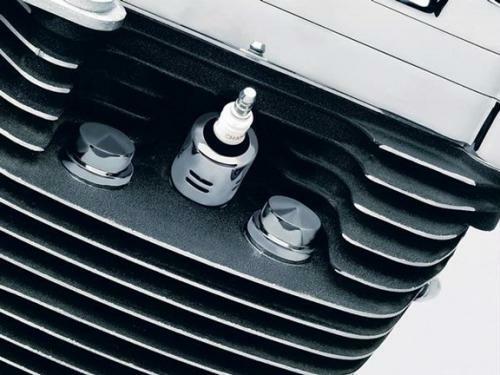 Unfortunately, almost all Harley-Davidson engines that vent the crankcase through the cylinder heads also expel oil through the same passages. Venting directly into the air cleaner, especially a free-flowing air cleaner, often results in an oily mess on the side of the bike. The banjo fittings and chrome tubes route the vented gasses upward so gravity can keep any expelled oil droplets in the engine where they belong. We recommend venting the crankcase to open air by running the vent line up and out of sight beneath the tank, but an optional catch tank is available for those who would rather vent to a closed container. Valido para: motocicletas utilizando el BLUEGRASS BREATHER KITS de Küryakyn. Precio original:73.50€ Precio Oferta:40.00€ IVA y portes incluidos. Beautifully highlight the transition from cylinder to engine case. Valido para: 00-06 Softails, 99-06 Electra Glides, Road Glides, Street Glides, Road Kings, 99-05 FXDWG y cualquier modelo 99-05 Dyna con mandos avanzados. Precio original:90.50€ Precio Oferta:40€ IVA y portes incluidos. Give your engine a facelift with our Hyper Streamliner! Its graceful lines give the original Hypercharger a totally new look without affecting its outstanding performance. Easy bolt on installation in minutes! Precio original:54.50€ Precio Oferta:18.00€ IVA y portes incluidos. Precio original:60.50€ Precio Oferta:27.00€ IVA y portes incluidos. This trick cover set takes the plain steel axle nut and adjustment slot out of the picture. Se puede montar en: Todas las Harley Davidson 88-00 FXR and 88-02 XL, 91-02 Dyna. Precio original:48.50€ Precio Oferta:18.00€ IVA y portes incluidos. Conceal both the switch body & the stock rubber insulators! Installation is a breeze. Precio original:29.48€ Precio Oferta:15.00€ IVA y portes incluidos. A quick and easy way to dress up the dull look of your Head bolts. These Head bolt Covers hide the whole bolt head for a much cleaner look! Precio original:31.66€ Precio Oferta:12.00€ IVA y portes incluidos. Precio original:50.00€ Precio Oferta:18.00€ IVA y portes incluidos. Harley did a great job with the chrome and braided stainless exposed oil lines on the Twin Cam Softails, but they tried to sneak by with a plain rubber line on the right side beneath the oil tank. They figured no one would notice... we did! So we designed a slick, chrome two-piece cover to dress it up. Precio original:60.80€ Precio Oferta:27.00€ IVA y portes incluidos. Precio original:48.54€ Precio Oferta:20€ IVA y portes incluidos. Bolt them on and dress it up! Our bracket accents are a super easy way to cover up that lower saddlebag support where it meets the lower fender bracket. Three cool styles to choose from. Precio original:64.00€ Precio Oferta:30€ IVA y portes incluidos. Transform The Right Side of Your Awesome Twin Cam Engine with These Easy to Install, Luxurious Covers. Available For All Bikes Equipped With Stock Head Pipes or Aftermarket True Dual Pipes. Precio original:86.21€ Precio Oferta:40€ IVA y portes incluidos. Universal para tornillos de 12mm. Precio Original: 70.00€ Oferta: 25.00€ IVA y portes incluidos. Precio Original: 30.00€ Oferta: 16.00€ IVA y portes incluidos. Precio Original: 19.50€ Oferta: 9€ IVA y portes incluidos. Easy & neat, this cover installs right below our Boomerang Frame Cover on the left side of your bike. Precio Original: 60€ Oferta: 27€ IVA y portes incluidos. This shining chrome trailer hitch ball cover fits all 1-7/8" and 2" balls. It includes a foam lining to ensure a good fit. Precio Original: 19.90€ Oferta: 10€ IVA y portes incluidos. Engineered to shroud the lower portion of your bike frame, this distinctive chrome- plated cover hides the kickstand assembly, front engine stabilizer and the footboard mount. Instantly simplifies a usually unsightly area of the bike. This one simple cover turns the hodge-podge of the starter solenoid & all of its related wiring into one sculpted, glistening unit. It’s designed to work with the stock starter end cover & complement our Transmission Shroud & Cylinder Base Cover. These neck covers really dress up the exposed frame section of Harley´s touring rigs. The wiring harness, throttle cables and several large nasty welds are replaced by a beautiful stylized chrome accent. Mounting hardware is included to accommodate the different tank mounts used on these models. Wiring modifications are required on models using plug-in style ignitions modules that mount on the frame´s neck! Válido para todos los modelos de Harley Davidson Dresser y Road King 89-01, para modelos 02-05 el cable de arranque ha de ser reemplazado por uno igual pero de los modelos anteriores. Precio original:112.55€ Precio Oferta:55.00€ IVA y portes incluidos. These streamlined trim rings, besides looking sharp, can also reduce glare in some situations. Easy installed with supplied silicone. Precio original:40.00€ Precio Oferta:18.00€ IVA y portes incluidos. * Intended for riders that already have Küryakyn Phantom Covers or similar style axle covers. * Covers upper and lower tubing and the upper sections of the swingarm. * In some instances, depending on the coverage provided by the axle covers, there will be a small gap between the tubular swingarm covers and the axle covers. If the existing axle covers do not cover the weld between the axle plate and the tubing, there will be a gap. If the potential of this gap causes concern, we suggest purchasing one of our complete Swingarm Covers Sets. Valido para: Todas las Harley Davidson 00-07 Softail (excepto 00-07 Deuce; 07 FLSTF, 06- 07 FXST, FXSTB, FXSTS). Precio original:175.00€ Precio Oferta:70.00€ IVA y portes incluidos. This great looking Crankcase Breather keeps oil from being ejected into the air cleaner through the breather system. Excess oil now runs back down into the engine, rather than running into the air cleaner to be blown all over your bike. Precio original:90.00€ Precio Oferta:35.00€ IVA y portes incluidos. Masking the roughly finished forged frame neck on a Twin Cam Softail is now as easy as two screws and a few minutes of your time. We´ve designed a smooth and cleanly contoured set of stamped steel neck covers to work on Softail Models equipped with fork tins (Heritage, Fat Boy, etc.) with a second version for the Deuce. These beautifully chromed covers mask the wiring, giving your bike´s neck a finished appearance. Válido para todos los modelos de Harley Davidson 00-07 Deuce. Precio original:112.55€ Precio Oferta:45.00€ IVA y portes incluidos. It´s like taking a step back in time while traveling into the future. The Train Rod´s sleek shape is reminiscent of the streamlined trains of the 30´s and 40´s while its integrated amber L.E.D.s are right out of the 21st century. The rod installs quickly and is easily wired into the bikes run circuit. Precio original:180.00€ Precio Oferta:70.00€ IVA y portes incluidos. Attention pyromaniacs: Light up your shift arm with this easy-to-install cover. Precio original:65.00€ Precio Oferta:30€ IVA y portes incluidos. These elegant Gauge Bezels blend beautiful chrome rings with tasteful, colored accents.The rubber-like accent is captured by the press-on chrome ring. Each pair of bezels includes black, red, & blue accents giving the rider options at the time of installation to select the color that best complements their motorcycle´s paint scheme. Precio original:71.50€ Precio Oferta:35€ IVA y portes incluidos.